Your brand is who you are—it's the heart and soul of your business. 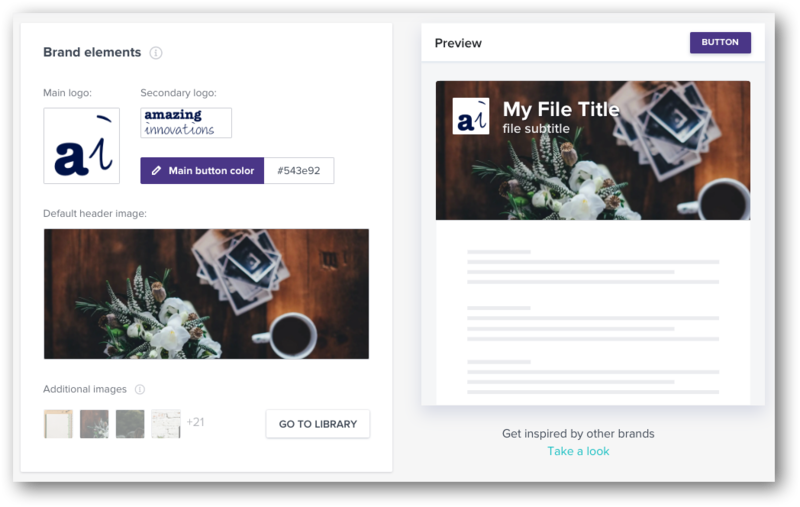 Uploading your company's images and assets into HoneyBook ensures that all communication going out of the platform looks like your company and aligns with your brand, and the clients receiving your files and emails will feel the continuity! 3. In the Brand Elements section of the Company Brand tab, upload your logo by clicking on the Main Logo and/or Secondary Logo field. Images should be in PNG, JPG, or GIF format. Main logo: featured on the image banner at the top of Brochures, Proposals, Contracts, and Invoices. The ideal image size is 100 x 100 px. Secondary logo: featured in the header of your Contracts. The ideal image size is 300 x 100 px. 4. Select your brand color by clicking Main Button Color—you can select from the color chart, or type in your hex code. Click Choose when you're ready. Button color will show on any client-facing buttons in files or emails. HoneyBook Tip: When selecting a brand color, be sure that this color easily visible to your clients. Lighter colors may not stand out enough!. 5. Select a default header image for your Projects and files. The ideal image size is 750 x 300 px. You can choose to upload a new image, or select from any images you've already added to your Library. Headers will default to this image when you create new Projects or files, but you can always change them. HoneyBook Tip: Check out the Preview on the right to see how everything will come together! 6. In Additional Images, click Go To Library to open your image Library, where you can upload additional photos to use in your documents. Learn more about the image Library here. PLEASE NOTE: At the moment, while you're able to update your logos through your own HoneyBook account, you'll need to contact our Concierge team in order to delete them entirely. Just send us a message by clicking the Question Mark icon on any HoneyBook page!